With just two weeks left in an overly-long federal election campaign. Political leaders, economists and editorialists opine on a daily basis on the nature of the ills facing the Canadian economy and their chosen policy antidotes. Exaggerated claims about how minor policy changes will reinvigorate the Canadian economy and boost the wellbeing of the "middle class" are commonplace. I just find the discussion quite unhelpful. It's especially unhelpful when what has happened to the economy is very narrowly defined. Poloz said the discussion was "especially unhelpful" because the contraction was narrowly focussed on the oil and gas industry and suggested that "the fundamentals are positive and gathering pace in about 80% of the economy". While I agree that the debate about recession is unhelpful, it for different reasons. Canada is not experiencing a normal business cycle recession. It is experiencing a severe negative terms of trade shock. The terms of trade refers to the price of Canada's exports relative to the price of our imports. A negative terms of trade shock occurs when a country's export prices fall relative to the prices of its imports. The terms of trade is of crucial importance to Canada, a medium sized economy that depends heavily on international trade for its growth and prosperity. In Canada's case, the terms of trade are subject to large swings. This is because a large proportion of our exports are commodity based -- oil and gas, metals and minerals, forest products and agricultural products -- and the prices of these commodities are more volatile than the prices of Canada's imports, which are predominantly finished manufacturing products -- motor vehicles, consumer goods and business machinery and equipment. In recent years, oil and gas exports have become increasingly important, accounting for 23% of Canada's goods exports in 1Q 2014, before the recent sharp decline in the price of crude oil. In total, commodity-based exports accounted for 51% of Canada's total exports. The plunge in the world price of oil, along with weakness in prices of other commodities has dealt a severe blow to Canada's terms of trade. 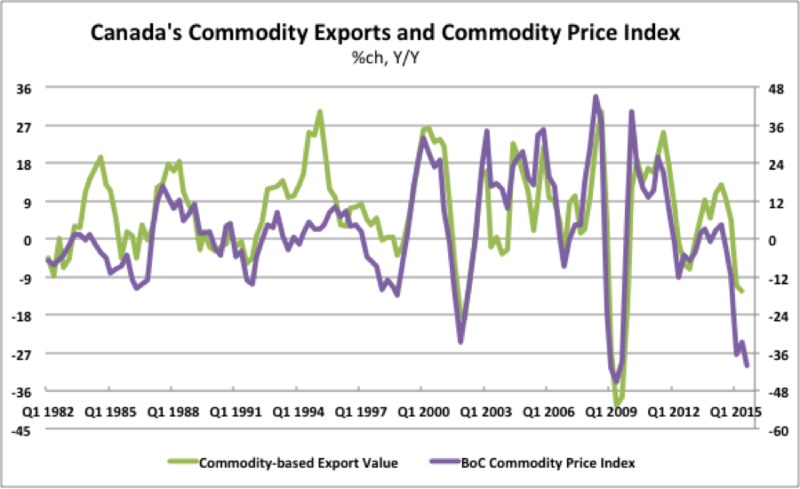 The chart below shows the strong link between the value (in current dollar terms) of Canada's commodity-based exports and the Bank of Canada's Commodity Price Index. Indeed, the link appears to have become even closer over the past 15 years as the development of Canada's oil sands added to its commodity exports. The latest available data show that the Commodity Price Index was down 40% in 3Q15 from a year earlier. This implies a further significant decline in Canada's commodity-based export values, which were already down 13% from a year earlier in 2Q15. 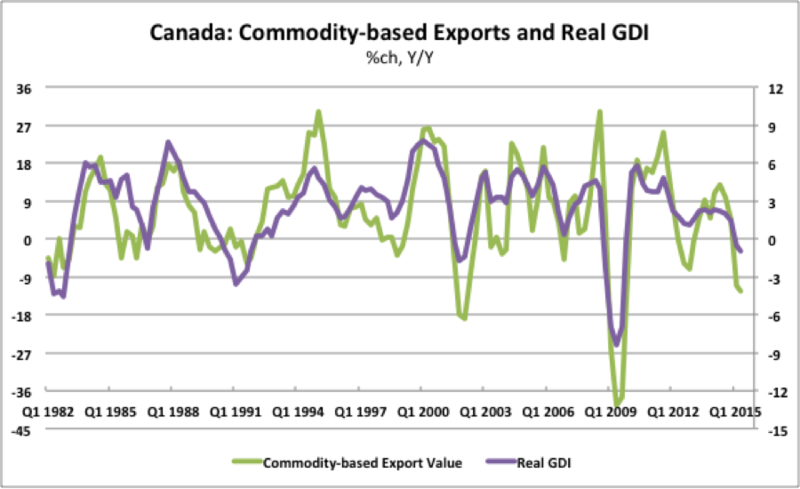 While it is well understood that falling commodity prices hurt the value of Canada's commodity-related exports, what is less well understood is the direct effect that this has on Canada's Real Gross Domestic Income (GDI). Real GDI is total domestically-generated income, adjusted for inflation, of all sectors of the Canadian economy, including the household sector, the corporate sector and the government sector. The chart below shows the tight relationship between the value of Canada's commodity-based exports and real GDI for the total economy. Real GDI fell 1% from a year earlier in 2Q15. Based on the further decline in commodity prices in 3Q15 and the consequent likely further decline in commodity-based export values, real GDI growth is likely to have fallen further in 3Q15, even if real GDP growth turns positive. The only times that real GDI has fallen as sharply over the past four decades are during the 1981-82 recession, the 1991 recession, the bursting of the Tech Bubble in 2001, and the Great Recession of 2008-09. Canada's prosperity is determined, not by real GDP which is a measure of the how much we produce, or by employment which is a measure of how many of us are working and how many hours we work, but by real GDI, a measure of the real value of the income we receive for the work that we do. The prices that we receive in world markets for the commodities that we extract, process and export are a primary determinant of real GDI growth. A terms of trade shock generated by a sharp fall in commodity prices can have just as negative an impact on Canada's prosperity as a deep business cycle recession, defined by sustained declines in production and employment. What is also little understood is that a fall in the value of the Canadian dollar which accompanies a fall in commodity prices further erodes real GDI. As the currency weakens, the prices of imported goods, which are dominated by finished consumer goods and business machinery and equipment, rise in Canadian dollar terms. This exacerbates the drop in the terms of trade and increases downward pressure on real GDI. This is also why BoC Governor Poloz's suggestion that the effects of the terms of trade shock are "narrowly defined" is misleading. When the price of oil and other commodities declines, the real income of oil producers in Alberta falls, but so does the purchasing power of consumers in Ontario, Quebec and other provinces, who must pay more for imported goods, services and foreign travel. The terms of trade shock is shared and spread across regions and industries by the fall in the value of the Canadian dollar. The real incomes of all Canadians suffer when the price of oil plunges and the Canadian dollar depreciates in value. The problem for politicians and policymakers is that the negative terms of trade shock comes from outside Canada, not from changes in the behaviour of domestic consumers, corporations or governments. The current terms of trade shock has many causes, including the development of new technologies that have lowered the cost of producing oil; the decision by Saudi Arabia and other OPEC countries to continue to pump oil at a high rate rather than cut production to support the oil price; and the slowdown in China's economy which has lowered demand and prices for a broad range of commodities. Whether or not the downturn in the global commodity super-cycle causes a business-cycle recession measured by GDP and employment is not the most important issue. The most important point to grasp is that Canada is facing a period in which the combined real income of households, corporations and governments are declining and are unlikely to rebound quickly. Even if real GDP resumes growing in the second half of 2015 and employment continues to rise, we will be producing and working more but receiving less real income for our efforts. The real economic issue that politicians should be facing is not whether Canada has slipped into a modest business cycle recession, but rather what is the appropriate economic policy response to a lasting negative shock to our national income caused by the fall in the prices of the commodities that we produce. The Conservative Party wants to stay the course, keeping taxes low, encouraging home-ownership, and pursuing a balanced budget. That is a reasonable start, but does not go far enough in providing incentives to boost growth outside the resource industries. The Liberal Party wants to raise taxes on high income earners including high-income small business owners, reshuffle child benefits to favour the "middle class", and incur deficits to fund infrastructure projects. The difficulty in this approach will be to maintain business confidence and to control deficit spending in an environment of weak GDI growth. The New Democratic Party (NDP) wants to raise corporate taxes, impose carbon taxes, expand government's role in child care, and pursue a balanced budget. This is a difficult if not impossible set of promises to deliver on during a period of weak commodity prices. The worst election outcome, but perhaps the most likely according to current polls, would be a coalition government of the NDP and Liberals. Coalition economic policies would likely result in higher taxes on high income earners, small businesses and corporations, increased spending on government provided child-care and infrastructure, and an early loss of control of budget deficits. All three political parties and all Canadian voters would be well advised start thinking about what kind of pro-investment, pro-growth policies Canada needs to pursue in a period when the main economic engine and source of national prosperity has stalled and shifted into reverse.